Margaritas. Yes. Watermelon. Yes. And then comes the salt!!! I am actually not usually a salted rim kind of girl, but sometimes it is the right contrast of sweet and salt, and this is one of those times. I thought that this would be EXCELLENT and festive and beautiful for the 4th of July just around the corner, or really just any hot Summer night that you were craving a cocktail! I’m not a salted rim girl either but I would definitely go for a few of these – oh I could do some damage! They look PERFECT! Pinned! You make the best drinks! These look killer, just what I need by the pool! Absolutely love everything about these! This is such a cool recipe. Love it! Another gorgeous drink! 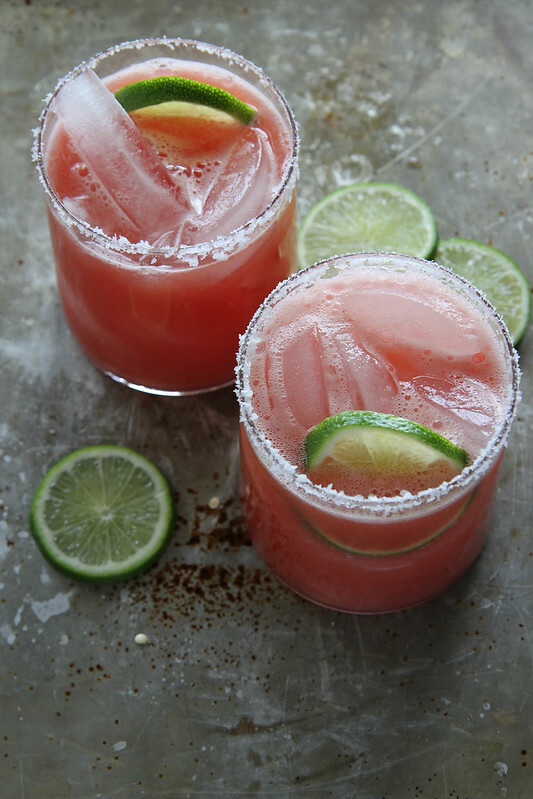 I’ll be picking up an extra melon at the market this week so I can make this margarita! Cheers! Is it Friday yet? These look phenomenal and I just so happen to have a watermelon ready to be cut! I’m usually not a salt on the rim kind of girl either, but for these I could be! The pictures and such look to die for. I can not wait to make them for the 4th of July weekend. I was following the instructions then I seen the word blueberries. I’m sure typo! Yum! These look so refreshing for summer. You said put “everything” in a pot and let simmer, so all the watermelon, sugar and water? But then in the instructions it mentions blueberries. So, do I add blueberries too? This sounds delicious! Can’t wait to make it:-). Heater- just a typo- sorry! Fixed! I love the pink color with the green of the limes – so preppy and probably crazy delicious, too! I buy local small sugary sweet seedless melons. Weird foamy stuff happens when I whir them up in the blender (maybe those tiny tender seeds you don’t even notice when you eat it whole?). What kind of watermelon are you using. Any weird foam? Michelle- all fruits and veggies produce that weird foam! Just skim it off the top and discard if it grosses you out! These look KILLER! I’m so ready for one right now (even though it’s not even 8am :-)). Pinned! This literally made my mouth water! 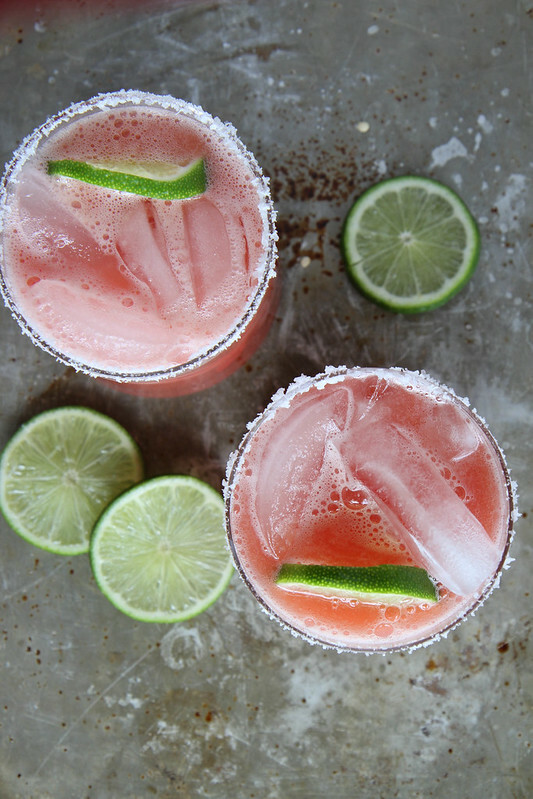 Margaritas are my jam and these are a must make- beautiful photography too! For the Watermelon Syrup: Bring everything to a simmer and let cook for about 5 minutes over medium heat, exactly what is watermelon. Looks delicious and can’t wait to try. These were AMAZING! We made them for a Fourth of July dinner & pool party. Had to make several batches. Thank you for the awesome recipe! These sound amazing! 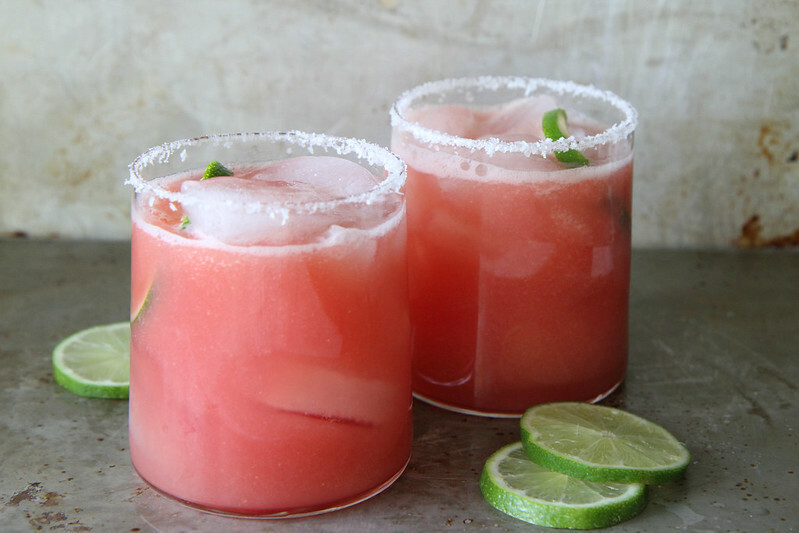 I love fresh watermelon in drinks and if there’s tequila, then that’s even better! Simple to try.I am going to make this for a special moment.